What if our thinking was only driven by cultural assumptions and hidden fear? blindness, struggles, and violence as a reflection of the quality of our thinking. Mankind has achieved progress in so many ways these past 50,000 years, but psychological evolution is still far from a solid realization. Why? This film takes us on a thought-provoking ride through some of the greatest uncharted territories yet – man’s mysterious psyche itself. 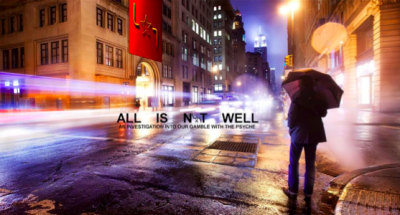 “All Is Not Well” reflects on our historical and personal way of life, which we will show is mainly characterized by psychological confusion and our restless need to cling to beliefs. Why do we so often choose to think through pre-packaged cultural, religious and ideological values as an attempt to find solutions that paradoxically have, time and time again, resulted in irrational conflicts? If we do not deal with this question, then we will continue, stuck, in a never-ending gamble with our psyche. We are currently looking for sponsors helping us making this film!